A few days of bland food finally helped me recover from the Wings from Hell, and I was ready for another food adventure. Jeremy caught a segment about Parker’s Maple Barn, a southern New Hampshire sugar house and restaurant, and once we saw ribs on the breakfast menu, we decided it would be the perfect Saturday morning outing. After a surprisingly short and pleasant drive, we arrived to find the giant barn hopping. We ordered two huge breakfasts: him, the Maple Baby Back Ribs and Eggs with a side of pancakes, and me, the Mini Parker’s Special. My breakfast was anything but mini, with pancakes (I loved raspberry – the flavor of the month), an egg, bacon, sausage, ham, large pieces of toast, and Maple Baked Pea Beans in place of the usual home fries. 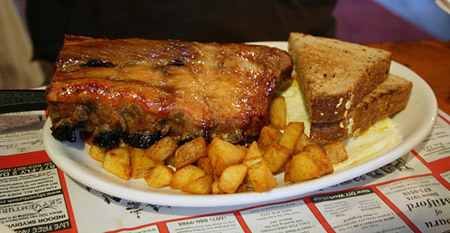 As for the ribs, I’ve never had ribs cooked outside of the barbecue style, and these were good, but we both agreed that once is enough and our next visit would probably be for a “normal” breakfast. After breakfast we stopped in the store and picked up some maple syrup. I love the more flavorful Grade B syrup, especially because its flavor holds up better in baking. The next day, I discovered it made my maple granola even more delicious than usual. I can’t wait to return to Parker’s Maple barn during sugaring season next year.